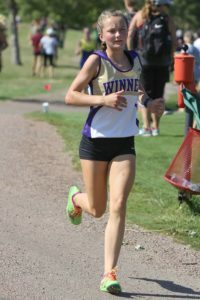 Winner Area girls cross country team won the Burke Invitational on Thursday. In the boys varsity, Kade Watson placed 8th, Joseph Laprath, 18th; Wyatt Turnquist, 20th. In the junior girls varsity race, Madison Thieman placed 4th, Katherine Jankauskas, 10th; Gabby Kocer, 11th; Trintiy Vrbka, 12th. In the junior high race, Konner Osborn placed second. The next meet will be Oct. 4 in Parkston.